A journey to London by stagecoach took four hours. There were two coaches daily in each direction leaving, from the Essex Arms, Rose and Crown, George and Green Man. The equivalent of first class travel was the ‘Box Seat’ charged at two shillings and sixpence. 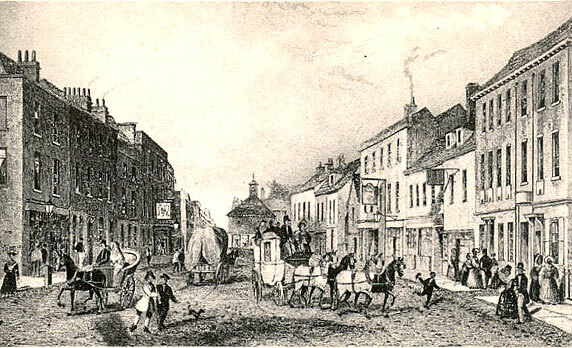 But, by bringing Watford a little closer to London, the stage-coach gained the town a dubious reputation as a centre for the macabre, yet lucrative, practice of bodysnatching. The convenient network of roads made it easy to spirit the bodies away into the anonymity of London. The last regular horse-drawn coach service through Watford was in 1886. An advertisement called it the ‘wonder coach’. I am very interested in the old Stage & Mail coaches, nice to have seen this picture.